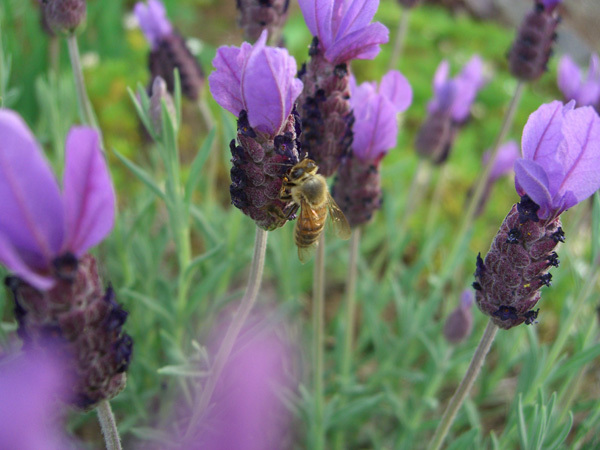 I know that it’s really summer (no matter what the calender says) when the lavender starts to bloom. This is a Spanish lavender — I don’t remember the variety name. I grow several varieties of lavender, and this is the first to bloom. 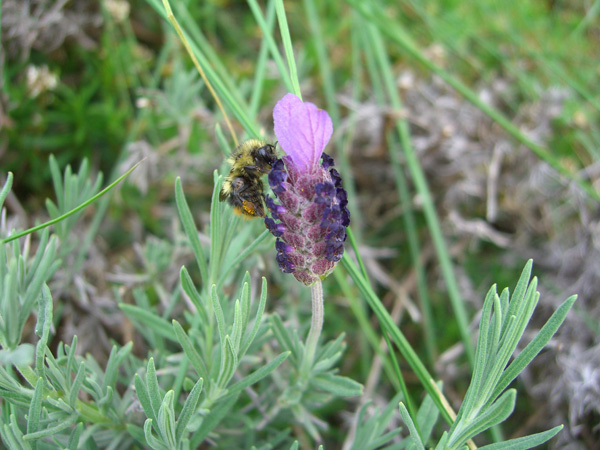 Bumblebees love the lavender, as do honeybees. That’s a bumble in the top picture (they’re my favorites) and a honeybee in the bottom pic. I can often find our native bees visiting also. When the butterfly bush is also in bloom all of the bees really go to town! I can also tell that it’s summer because the temperature was over 90 today. As far as I’m concerned, that just plain too hot. But I know it will ripen the cherries and bring a blush to the strawberries and give the grapes a little boost. So I’m not complaining. But it’s way too hot to knit on a sweater. Way too hot. Right? So what would you do? That’s right, I cast on a second pair of socks. I started Mermaid sock toes, using Lorna’s Laces in a colorway called Rainbow. It’s really bright. I’m not far enough into them to decide if I like them or not. We’ll see. Remembering the Mermaid socks I started last year and then ripped out because they were too huge, I did something I never do — I swatched. Hopefully I’ve got the gauge right this time. Pics in a day or two if I decide to keep them going. #1 Son is in town but not around much. For some reason, after being gone for 3 weeks he thinks it’s more important that he hang with his friends than with his mom! Go figure! 😆 I don’t mind at all. I’m just glad to be able to call him on the phone and know he’s within 10 miles or so. I had a very nice thank you card today from my Sockapaloooza recipient Lynne. You’re welcome, Lynne! I enjoyed the experience very much. To Sockpal, if you are listening… I hope my socks survived their washing and have not gotten lost on the way here. Perhaps they are out gallivanting around with my little cow tape measure that disappeared? P.S. Also hope everything is OK with you? Evil is like a shadow - it has no real substance of its own, it is simply a lack of light. You cannot cause a shadow to disappear by trying to fight it, stamp on it, by railing against it, or any other form of emotional or physical resistance. In order to cause a shadow to disappear, you must shine light on it.